The City of Port Alberni seems to have very knowledgable and well-experienced staff. Due to lack of a centralized tool, staff started to develop their own toolsets, often by creating extensive spreadsheets, or by creating self-administered database systems. Several on-site interviews were conducted with staff from City of Port Alberni by i-Open Technologies in order to find out the City’s current status and where it nees to be in both short term and long term, as an enterprise wide strategy. In order to leverage existing investment in data and extend that data to other departments in order to streamline work in the field and capture data in the field, i-Open has developed a custom map based viewer on top of i-Open’s inspectworX solution. Port Alberni has a number of corporate databases as well as an extensive set of data of digital and hard copy data within various departments in the organization. In many cases this data is disconnected from other relevant data. 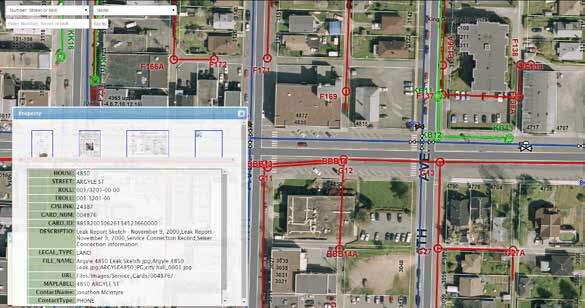 For example, while CAD files store information on the location of property throughout the City, it is not connected to the Financial system which stores the information about the assessment, taxes and owners. Further, high value utility data (water, sanitary, storm and roads) exists in CAD files, spreadsheets, databases, scanned and hard copy service cards. Staff have to look in multiple locations to get the required information to do their daily jobs and this takes extra time, results in duplicate and missing data and ultimately decreases their ability to service their constituents. City staff are mandated by their corporate Strategic Goals to: “ensure a responsive and high performance workforce”. Current process require field crews to carry a paper version of maps and service cards in every vehicle. Preparing these documents takes a full week of work per year and have a high cost for production and they are out of date immediately. They are therefore only updated yearly and so current data has to be checked before heading out to the field. The field staff also finds that the make numerous trips back to the office to verify information or pick up related service cards. Field updates to data may not make it back into the system if the paper does not get submitted to Engineering. The City has seen significantly reduced overhead in accessing maps and service cards and allows access to all the historical and relevant data that normally wouldn’t be available readily in the field saving further time by reducing return trips to the office. Markups that often went missing are now tracked as part of the digital record and photos of actual field conditions can be attached to the record easily instead of getting stuck on the camera. An unexpected side benefit is the access to information during “emergency events” such as blockages and water line breaks when time is of the essence. Once siloed data is now freed and integrated through a mobile application improving service to constituents, increasing efficiencies through timely access to relevant data, reducing data duplication and improving the capture, quality and flow of data from the field into the corporate record.